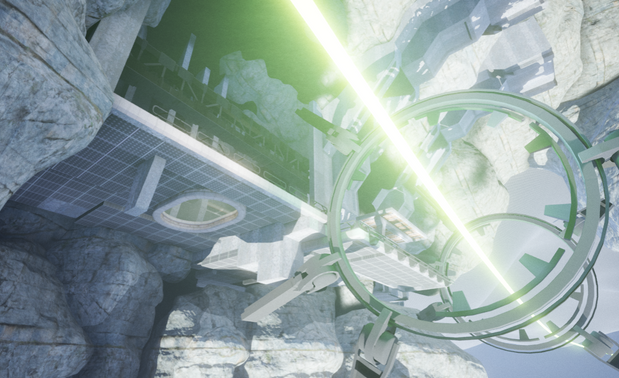 James Broderick Design Blog: Through The Gate - A World Below! I've been waiting to go back and do something from my own fictional universe for a while!. The last time I tried to make anything based from it was in college where I knew almost next to nothing about 3d but now seemed like a great opportunity to work from some of my old sketches and ideas and make them into something interesting for this project. The goal for this project is to create a sci-fi environment on the otherside of this door shape we have been provided, we can do whatever we want as long as the door is included and the environment includes some sort of procedural texturing and high poly baking. The high poly requirement is why I decided to do the weapons project first as a test, with the stylized shop front acting as a way to brush up on more traditional 3d techniques and planning. My aims for this project include creating a modular building structure I can reuse and apply for FMP as well as focusing on creating some really cool effects and other things in engine. 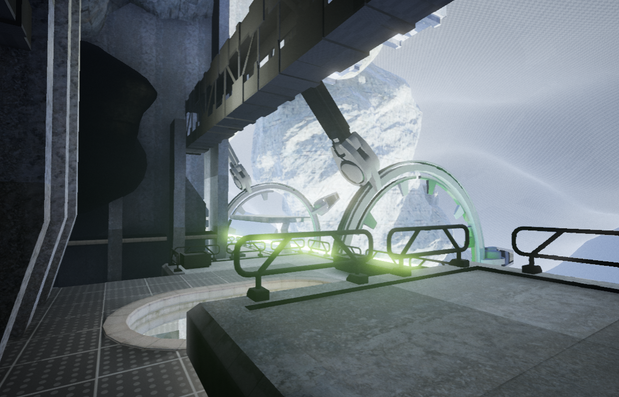 The overall goal is mostly making an environment which feels like it has a life of its own rather than just focusing on asset building, so a priority is to get stuff into engine as soon as possible. My first day was mainly dealing with how I would create this environment and what design cues it would take, my main point of reference for this project was architecture. Stas advised me to take a trip to the library and get some books on neo-brutalism and apply some of the forms and structures to creating pieces for my own environment. 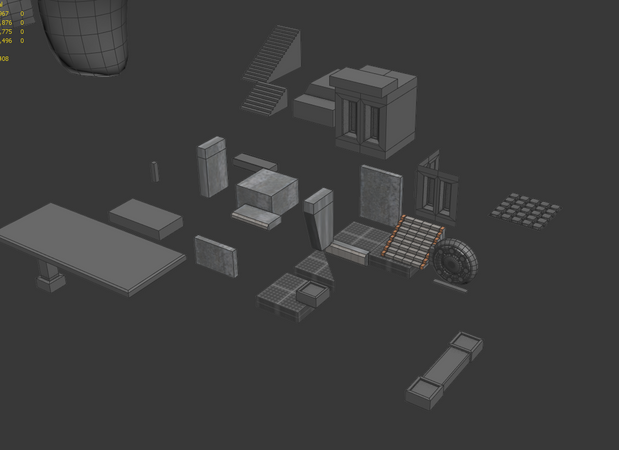 First I blocked out a simple plan of an environment made out of a number of smaller pieces. I liked this design at first but later fell out of favour with it due to it's lack of purpose and by how large it was. I had a brainwave wednesday night and went back to one of my old ideas about a skyrail: A transport system that can take people to platforms at crazy heights in this giant cave world. I made a real quick guide sketch of the idea and began to create some modular pieces to test a layout. I felt a lot more excited about this idea, as it gives the whole area a sense of purpose which is crucial for a more outlandish environment like this, it helps keep it grounded in reality. Reworked level plan - The basis of the train platform, this first iteration was a little too small for the train platform to work so I extended it out. I also looked at a lot of reference for brutalist train platforms and began to apply those forms to what I model, some things I twisted a bit. This shelter here was taken from a photograph but I moved the support and angled it slightly to give it a bit more of a interesting design. The screenshot below shows two new features I added. The glass holes in the floor help bring more light into the platform as the light is coming from the fake sun below in this environment, Casto suggested that it looked a bit odd and maybe it could serve a dual purpose like as a floor based display unit for train information or something else that could help it fit more nicely into the environment. The rings around the platform I intended to be stabilizer/guiding rings for the lightrail, more of these can be seen floating in the distance controlling the direction of the rail. Other uses of these rings were suggested to me though, Craig suggested that I make them more mechanical and maybe include more moving pieces to suggest that they are really heavy pieces of machinery, he told me to look at russian shipyards and heavy industry to look at all the metal constructions they used. I added in some support structures based from them. The next bit really helps to sell the light rail: The rail itself! 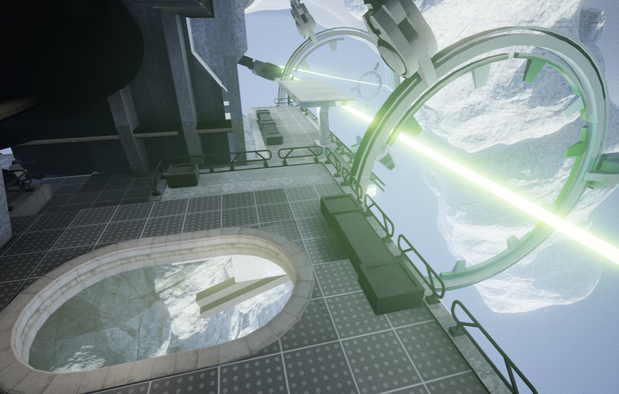 I created a splinemesh component inside UE4 and applied an emissive cyclinder to it, this means I can adjust the position and curve of the rail inside UE4 and add more points into the distance for when I get to fleshing out the view later on. 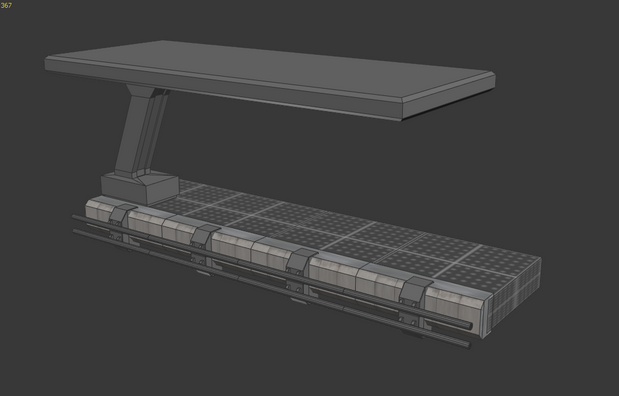 Another thing I plan to add is some kind of pulsating or flicker to the rail, to give it some life. 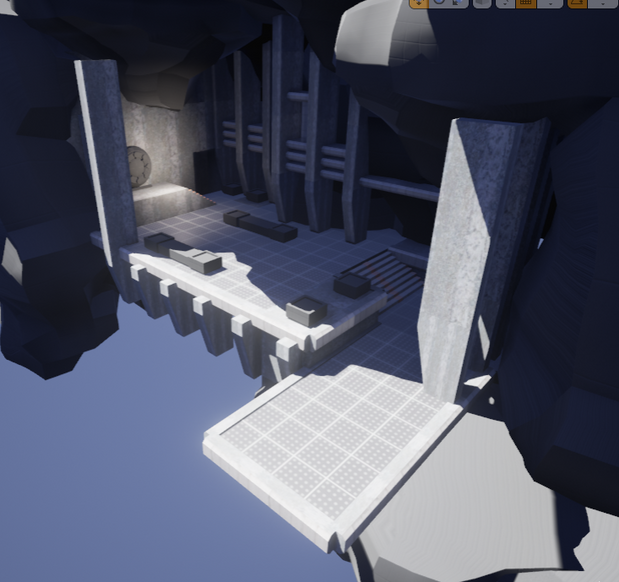 I spent a while trying to get the large cave rocks sculpted and looking right in engine but they still aren't where I want them, they need a more complex material and a better diffuse/roughness to bring out the detail. I had three types of rock I wanted to do for the environment but I'm going to see now what texture space I will have after I do the highpoly sections. 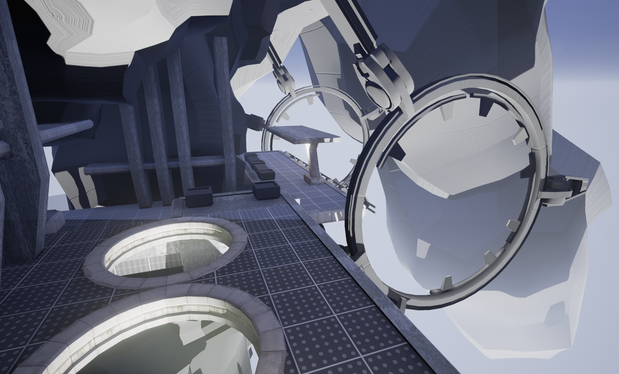 That is what I'm going to be focusing on next along with getting all the little environment props modelled.